Welcome to another of our Best of St Lucia with our readers. We wouldn’t have this amazing blog without including our readers. The goal is to show you how amazing St Lucia is and why it’s the place to be. St Lucia is also home to many weddings. It’s is such a romantic place to get married. This week we are getting married in St Lucia with Vee and Tyler. Why did you decide on getting married in St. Lucia for your destination wedding? This going to sound crazy, but I just loved the name at first when I was doing research, St Lucia. It sounds so lush, magical, and fancy. Once we visited for the first time, before we even landed, watching the island come into view from our little airplane window, it was so beautiful, we were sold. Getting married in St Lucia was just the perfect choice. We landed on Sandals La Toc. The resort was wonderful, and for the size of our group, which was 40, it was the best option for us. They also give you the option to travel to their location to stay with them to check out the resort. This is to decide if you are thinking of having your wedding there. When was your wedding held and how was the weather? April 1st, yes April fools Day! Half of our guest thought it was a joke. Honestly, we chose it because we figured it would be quite easy for both us to remember. It was hot in April, but bearable, sunny for the most part with some much-needed clouds throughout the time we were there. On the day of, we had some sprinkles of rain during our reception but we all took it as a cooling mist, it certainly didn’t ruin the fun. Did you use a Wedding planner to help with your wedding? Sandals were fantastic and had a few planners for us. We booked a year in advance and had a consultant that helped us plan a few things beforehand via phone. When we on location, we were given three wedding planners on site that helped us finish all the details three days ahead of time. They were such a pleasure to work with. Tell us about your planning process. Did you purchase your own décor or use the venues? The best part about getting married in St Lucia is the beautiful island, what more decoration do you really need? Okay…we did have a few extra wedding decorations that we purchased. I purchased some vases, candles with stands, rose petals from a dollar store, and made all my bridesmaid’s bouquets and brought it along. We put the bouquets in the vase as centerpieces and had candles and petals around the table. I had 5 tables and it cost me less than $60 to decorate. The staff at Sandals set it all up and took it down for us, and because it was such a small expense I ended up leaving the dollar store items with them. We also purchased one large flower piece for the reception, but other than that we were already surrounded by lush trees, flowers at the resort, and the blue ocean. Were the photographer and Dj provided for you? A friend of ours is an amazing wedding photographer, she is the owner of Whims and Joy Photography, we are so fortunate to have her come along with us. We purchased her flight and hotel, and she provided us with stunning shots over the course of two days, rehearsal, and the wedding day. We selected a DJ ahead of time that was recommended by the resort and sent a playlist along with what we definitely did not want to hear, he did a great job. We also hired a videographer from the resort, which I recommend. We have a 15-minute video capturing our entire day, it was well worth the investment. Was it easy to plan a wedding in St. Lucia? Absolutely. It didn’t go without a few hiccups, but overall it was stress-free, we wouldn’t have changed a thing. Getting married in St Lucia was a perfect choice. The resort food was catered towards their guest. I would have liked to see more island or native dishes. There was certainly versions of it, but it was fine, yet still all very delicious. One of my favorite nights was my rehearsal night. After dinner, there was a “street party” on the resort and there was a buffet of street food. I knew I shouldn’t have since it was the day before my wedding, but I had a second dinner that night, and I have no regrets, the food was delicious. Did you stay at the same Resort for your honeymoon? No, we stayed at Ladera for our honeymoon. I cannot even describe how breathtaking Ladera is. The resort is overlooking both Pitons and the ocean. There are only 3 walls, and the 4th side is open. We had our own private pool in our room, there was a four-post bed with a net, and at night you can just gaze up at the clear sky and the stars and Pitons. Just stunning. Can you provide a list of vendors you used? Sandals provided much of what we needed. We used Whims and Joy for photography, and Nora Events to coordinate and MC. What is the best memory of your wedding day in St. Lucia? Other than walking down the aisle seeing my soon to be husband, and giving killer vows that made my guests roar with laughter and cry at the same time? At the very end of the night, as soon as I heard the last song play I made a dash to the pool a few feet from our reception/dance floor and leaped it. When I came up from the water I saw the stars first, and then guest after guest jump and dive in fully clothed after me. It was so incredible, and one of the best times of my life. Getting married in St Lucia was so much fun. Would you recommend brides to have their wedding in St. Lucia? Yes! Do it. St Lucia is not only a gorgeous place, the people are so friendly. It’s such a relaxed way of life, and you can leave so many stresses behind, especially the planning process. You get to also have an extended vacation with your closest friends and family, how often can you get a group of people you love to one island? Also, you’re not spending your budget on one night. Our guests stayed from 3-6 days at an all-inclusive and got a wonderful vacation while attending our wedding. Did you do anything else on the island? We also went to the sulfur baths, which was neat. It was quite stinky, but my skin was so soft afterward. We went on a little deep-sea fishing expedition. My husband was the only one to make a catch, but I was sure trying, I was “jigging” my tail off trying to hook a fish. We made it to Sugar Beach with white sands, and crystal-clear waters. Lastly, we ate at Martha’s table outside of both resorts a couple of times. The seafood options were sooo good and affordable. Any last words about getting married in St Lucia? Happiest, and most loving time of my life. I will always be in love with St Lucia. 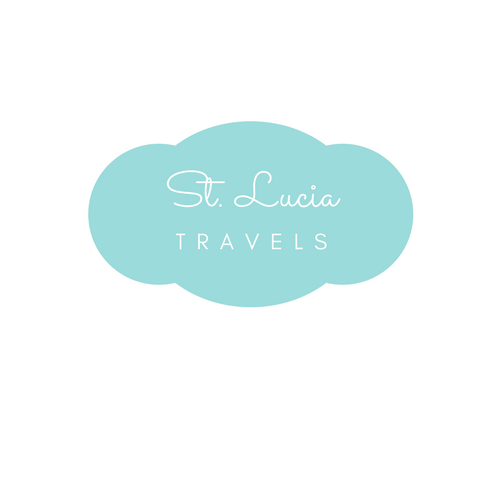 If you want to read the best of St Lucia with our readers, catch up here! Please spread the love and pin this post. Thank you, it’s stunning for sure. What a beautiful wedding you had?? I liked the clothes of the wedding party. Correspondingly St Lucia provided a beautiful back drop for the wedding.Now have a beautiful life. such a beautiful dress, and wedding! very inspiring!